This good sized nursery caters to most of your gardening and landscaping needs. They carry a full range of palm trees, other trees, desert plants, shrubs and flowering plants including most of the traditional plants found in the area. There are plants for indoors or outdoors and all sun conditions from full sun to shade. Besides the good selection of plants the nursery carries a big assortment of pots for plants in sizes ranging from small to huge. They also have fountains for patio and garden in many designs and sizes to meet all your needs and carry other garden adornments to accent your landscaping. The nursery is open every day from 8am to 5pm. The telephone number is 612-145-0283. 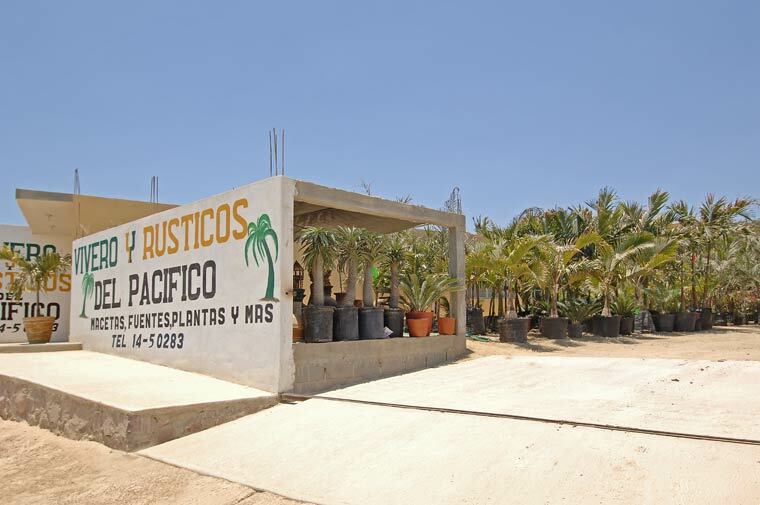 Vivero y Rustico Del Pacifico is located in Las Brisas on the other side of Todos Santos off Calle Las Playitas.